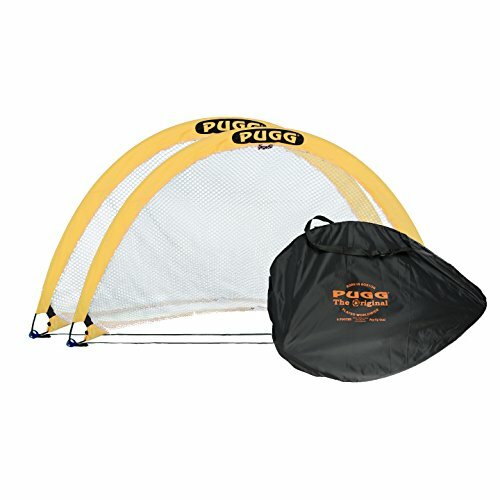 The 6 Foot PUGG Pop-Up Goal is designed for maximum portability and performance. Its intuitive twist-to-close design folds down to a 1” flat oval, allowing it to fit compactly in its carrying case. Weighing only 7lbs on your shoulder, a pair of PUGG goals are ready for you to take the game with you - wherever you play. 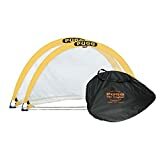 Help your child or adolescent hone his or her soccer skills with this Pugg portable 6 Footer training goal boxed set, which includes two goals and a bag. Also available in 4- and 2.5-foot sizes, the Pugg 6 Footer is ideal for clinics, backyard contests, and even organized games at the park. Each 6 Footer goal is remarkably easy to set up: just hold on to the corners, and then twist the left corner counterclockwise while bringing the hands together. The 6 Footer goal sets up with a quick twist of the hands. 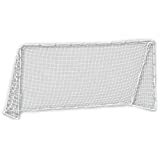 The goal collapses just as quickly into a flat oval that measures 1-inch thick, with a handy carrying bag for easy transport. 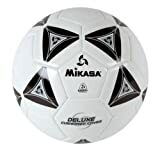 As a result, you can vacate the practice field as soon as the weather turns, and without having to break down a cumbersome multi-piece goal system. Each 6 Footer measures 6 by 3.5 by 3.5 feet (W x H x D) when installed and is safe for both kids and adults. The set comes with two goals, one carrying bag, and anchoring pegs.